When it comes to beer styles I try to be an equal opportunity consumer, but I definitely gravitate towards some and shy away from others. One style that I typically avoid is fruit flavored beers as too many use an overpowering amount of fruit to mask the flavor of the beer. The exception I tend to make is for citrus flavored beers, a touch of lemon, lime, orange or grapefruit can be the perfect complement. I was intrigued when I found that Night Shift’s newest release was Grove, a saison brewed with Meyer lemon and ruby red grapefruit. Night Shift has a proven track record of using a variety of adjunct ingredients in their beers that contribute harmonious flavors without overwhelming the brew. Combine that with my goal of exploring the saison style this Spring and Night Shift Grove became a priority purchase. Night Shift Grove pours a deep copper, slightly cloudy with a medium white head. The smell is intense citrus fruit followed by mild scents of esters and spice from the Belgian yeast. The fruit flavors come through strongly in the initial flavor, with lots of lemon and grapefruit. There isn’t much acidity or bitterness. Meyer lemons are sweeter and less tart than traditional lemons and ruby red grapefruit follows suit, so you don’t get the mouth puckering flavors of lemon or grapefruit juice. The Belgian yeast is present, contributing some tastes of pear and pepper. There is a solid malty backbone, touches of biscuit, grain and cracker. 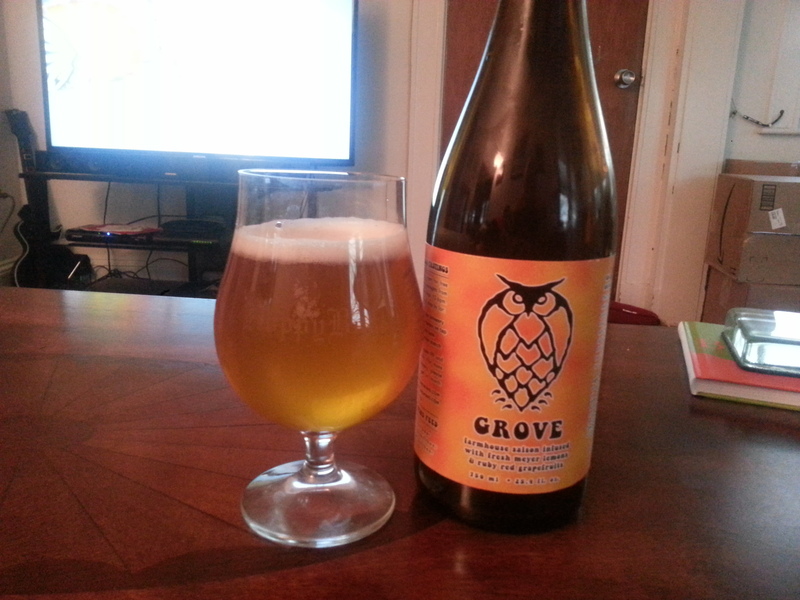 Night Shift Grove is light bodied and easy to drink. The 6.9% ABV is well masked. This is a great summer beer, the citrus is well represented without overwhelming the full saison flavor. Hoppy Boston score: 4.5/5.